Toshiba today announced another line of affordable solid state drives from its OCZ acquisition, the TL100, which uses triple-level cell (TLC) NAND flash memory chips to keep costs down. 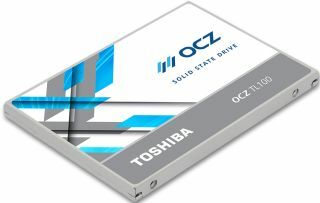 That wasn't the case with the OCZ VX500 series, another low cost SSD line that Toshiba announced a couple of weeks ago. In that instance, Toshiba made it a point to educate media and potential buyers that it was using multi-level cell (MLC) memory chips, claiming "3X the endurance of TLC-based SSDs." Here we are two weeks removed from Toshiba throwing shade at TLC chips, which it's now touting as a positive for its latest SSDs. "With Toshiba TLC NAND flash memory under the hood, the TL100 series prioritizes both quality and affordability delivering the reliable system storage end users can rely on," Toshiba says. The primary focus with this new line is value, though Toshiba's VP of marketing, Alex Mei, is quick to point out that value "doesn't have to mean end-uses need to sacrifice performance or quality." To that end, both the 120GB and 240GB models that comprise the TL100 line offer up to 550MB/s and 530MB/s of sequential read and write performance, respectively, along with up to 85,000 IOPS of 4K random read and 80,000 IOPS of 4K random write performance. Toshiba rates the endurance of the 120GB at 30TB of TBW (total bytes written), or 27GB per day, and 60TB for the 240GB model, or 54GB per day. Both drives are backed by a 3-year advance replacement warranty with no return shipping costs. Should the drive fail, Toshiba sends out a replacement along with a pre-paid return shipping label to send back the bad drive. Not a bad deal. It isn't known what controller these drives are using—Toshiba just says it's one of its own. Toshiba is pricing these drives at $45 (€45) for the 120GB model and $68 (€65) for the 240GB drive. That works out to around $0.38 per gigabyte for the 120GB drive and $0.28 for the 240GB model.